Jewish prænomen and family name, derived from the German "Bär" (bear). The Jews of Germany, like those of other countries, borrowed their names from their non-Jewish fellow-citizens; chiefly when equivalents of these names could be found in the Bible. Because the patriarch Jacob (Gen. xlix. passim) compared the qualities of some of his children to those of certain animals, the Jews eagerly adopted as proper names the German designations for these animals, such as "Baer," "Wolf," "Löwe." The older forms "Bera," "Bero" occur in the Memorbuchs (compare the old High German "Bero"). 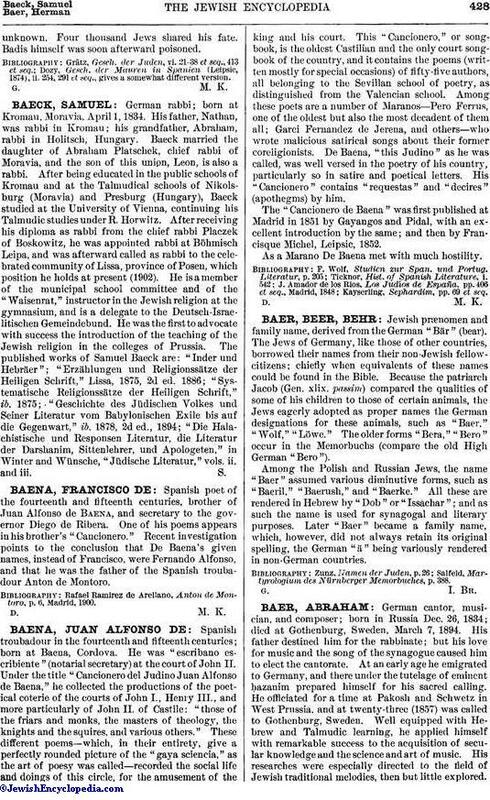 Among the Polish and Russian Jews, the name "Baer" assumed various diminutive forms, such as "Baeril," "Baerush," and "Baerke." All these are rendered in Hebrew by "Dob" or "Issachar"; and as such the name is used for synagogal and literary purposes. Later "Baer" became a family name, which, however, did not always retain its original spelling, the German "ä" being variously rendered in non-German countries. Salfeld, Martyrologium des Nürnberger Memorbuches, p. 388.